Please be patient as downloading of this page may take a little time. If for some reason every photo does not open up, please refresh your browser. 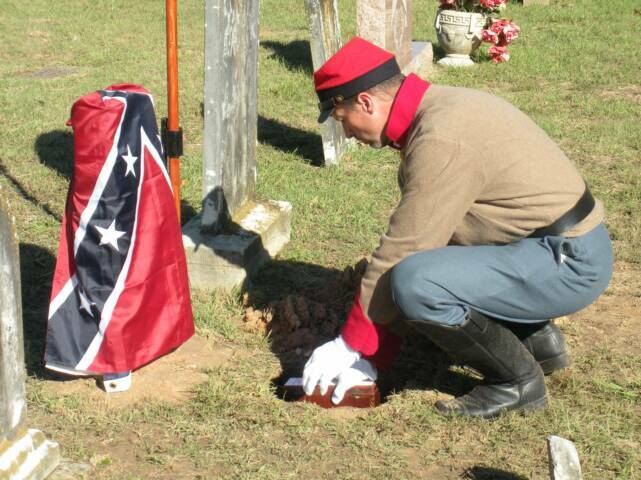 Reagan Camp Commander, Marc Robinson, lowers small box containing 1st Lt. Blackmon's earthen remains and a single Texas Confederate button into the grave. The two marker dedication ceremony held for Pvt. James Loflin and Pvt. George. W. Milner at Foster Cemetery on May 22, 2010 was well attended by family and friends. 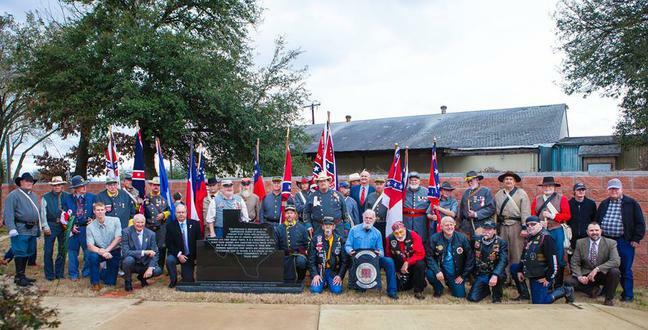 The John H. Reagan Camp #2156, Sons of the Confederate Veterans was assisted by the Johnson-Sayers-Nettles Camp #1012 of Teague, Texas, the Davis-Reagan Chapter #2292 United Daughters of the Confederacy of Palestine, Texas, and the Ladies of the Reagan Camp. The John H. Reagan Camp #2156 of Palestine, TX and the Johnson-Sayers-Nettles Camp #1012 of Teague, TX team up at the annual Military weekend at the Texas State Railroad park near Palestine, Texas held on May 29-30, 2010. There were military re-enactors and equipment depicting many different wars America has been engaged in as well as a WWII battle re-enactment seen after a train ride to the battleground. SCV members fired the Val Verde Battery's howitzer several times each day as well as the opening round for each mornings ceremony. 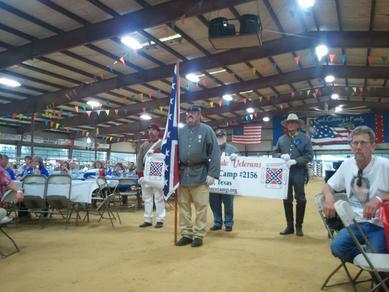 Members from our camps presented a Confederate living history type exihibit as well as having a recruiting table nearby. SCV members spoke with many visitors, other re-enactors, and passed out many business cards each day and posed so visitors could take pictures. Photo above left: L-R standing, Reagan Camp members Marc Robinson, David Dyer, Billie Newsom, Dan Dyer, Frank Moore, John Barnhart and kneeling is J-S-N Camp member Stanley Black. Photo above right: L-R Billie Newsom, Frank Moore, John Barnhart, Stanley Black, and Marc Robinson stand near the recruiting table. Davis-Reagan Chapter UDC annual John H. Reagan Memorial Ceremony, held on Oct. 9, 2010 this year, one day after his birthdate. The ceremony was held at his old home site, he called Ft. Houston, in Palestine. The Reagan Camp #2156 assisted with the colors and fired 3 rifles and cannon volleys. The John H. Reagan Chapter UDC from Gatesville, Texas assisted as well. L-R, Angela and Dr. James Burleson from Gatesville; Marc Robinson, Billy Newsom, John Barnhart, Frank Moore, Gary Williams, Dan Dyer, Ronnie Hatfield, Kirby McCord, and Calvin Nicholson of the Reagan Camp 2156; and Jane Pitts of Gatesville. The home site and monument is located at the intersection of West Reagan Street at Industrial Blvd. outside the Loop. The old original brick side walk leading up to the front porch is still there. Veterans in the Park Day, 11-6-2010 in Reagan Park, Palestine, Texas. 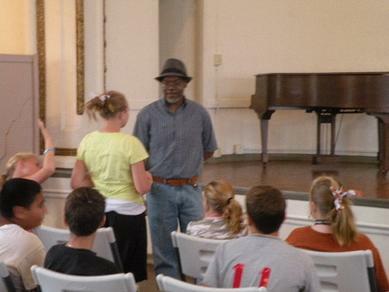 Members of the Reagan Camp representing Confederate veterans during the ceremony. 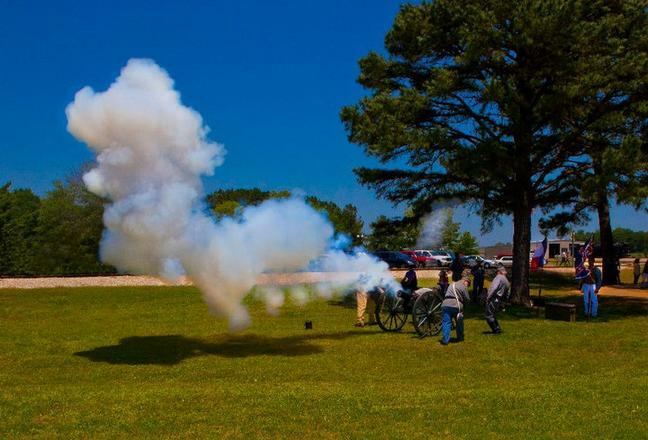 The John H. Reagan Camp's "Val Verde Battery" opened up the Veterans in the Park Day ceremony on 11-6-2010 with the firing of a cannon in Reagan Park, Palestine, Texas. 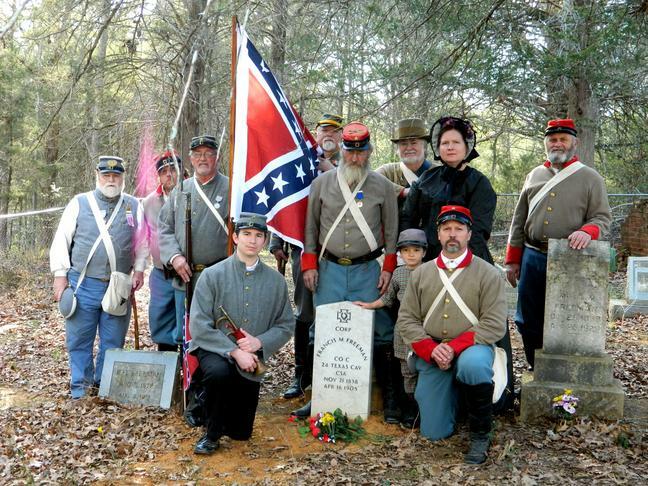 The John H. Reagan Camp #2156 hosted a Confederate grave marker dedication for Pvt. Lloyd T. Holmes, Co. C of the 13th Alabama Infantry CSA, and called a roll of honor for all 23 Confederate Veterans buried at the Tennessee Colony Cemetery, in Anderson County Texas on December 18, 2010. The Reagan Camp's Valverde Artillery Battery fired 3 rounds with their cannon and the Reagan Guards fired 3 volley's with their rifles this day. The Val Verde Artillery Battery and the Reagan Guards are pictured with the family (John’s widow, son and daughter) at the Confederate funeral ceremony for long time SCV member, Adjutant of the Johnson-Sayers-Nettles Camp, and re-enactor with the Val Verde Battery, John L. Robinson. 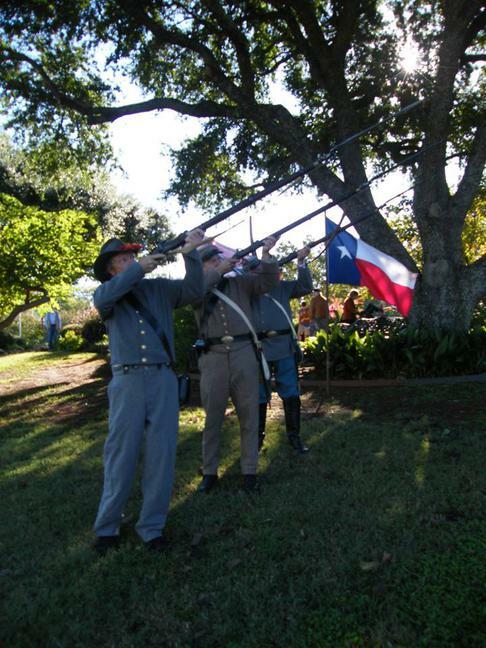 The Texas Division of the Sons of Confederate Veterans hosted an education event at Camp Gilmont near Gilmer, Texas from December 1-5, 2010 to commerate the first year of of the sesquicentenial of the War Between the States. It was called the Road to Secession and depicted events that caused the Good Christian people of the South to seceed. Pictured above are impersonators that took part in one stage of the event. Rudy Ray, of the John H. Reagan Camp #2156, did an outstanding job impersonating John H. Reagan and educating many school children and adults over the course of the Texas Division SCV sesquicentenial event titled, "The Road to Secession." 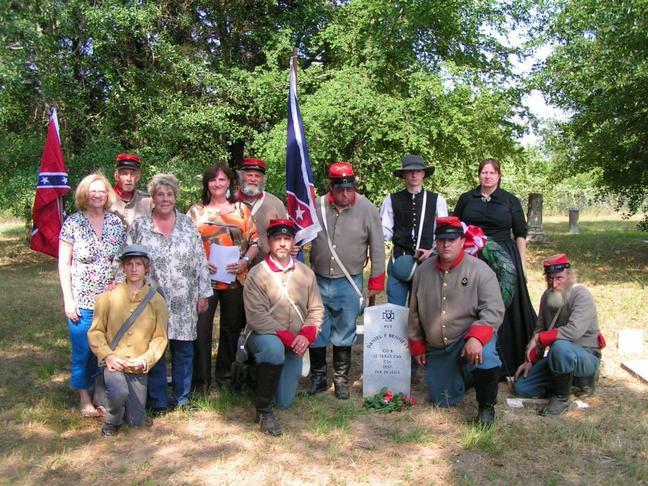 The John H. Reagan Camp #2156 hosted a grave marker dedication for Pvt. George Bars, Co. B, 11 Battalion, Louisiana Infantry, C.S.A.on March 19, 2011. The John H. Reagan Camp #2156 recruitng display at Camp Ford's Living History event hosted by the Douglas Camp. 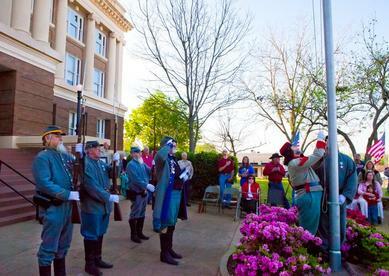 The John H. Reagan Camp #2156 held a flag ceremony at the Anderson County courthouse on April 1 to raise the Confederate First National Flag under the U.S. and Texas Flag. This was done in honor and remembrance of the 1000 Confederate veterans who served Anderson County during the War Between the States. There are over 500 Confederate Veterans buried in Anderson County. The Confederate First National Flag flying at the Anderson County Courthouse on April 1, 2011. 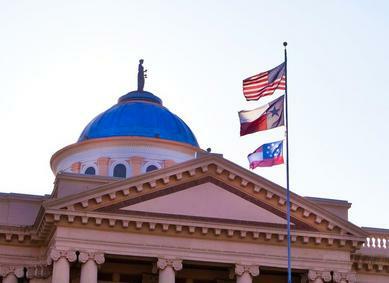 The intent behind the flying of the flag was solely out of honor and rememberence during the month of April, which is Confederate History Month in Texas established by Texas Senate Resolution No. 526 on March 30, 1999. 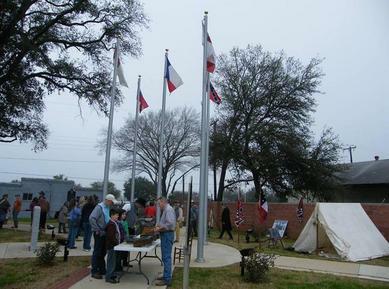 The John H. Reagan Camp #2156 represented the Confederate Veterans at a Veterans Rally in Crockett, Texas on April 30, 2011. The name of the Rally was God, Family, and Country. The John H. Reagan Camp #2156 SCV set up a recruiting booth at the Veterans Rally in Crockett, Texas on April 30, 2011 as well as fired two rounds from one of the Val Verde Howitzers (cannon behind display). 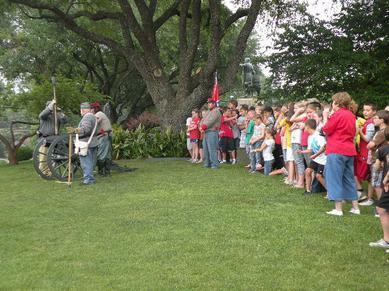 The John H. Reagan Camp #2156 SCV participated in the Neches, Texas Heritage Day event on May 7, 2011. Above camp members and helpers are pictured in the cannon trailer (can't see the cannon real well) preparing for the parade through downtown Neches. The John H. Reagan Camp #2156 set up a recruiting booth (background) and displayed authentic rifles, pistols, and ammunition on a table (foreground) used during the War to Prevent Southern Independence at the Neches Heritage Day on May 7, 2011. 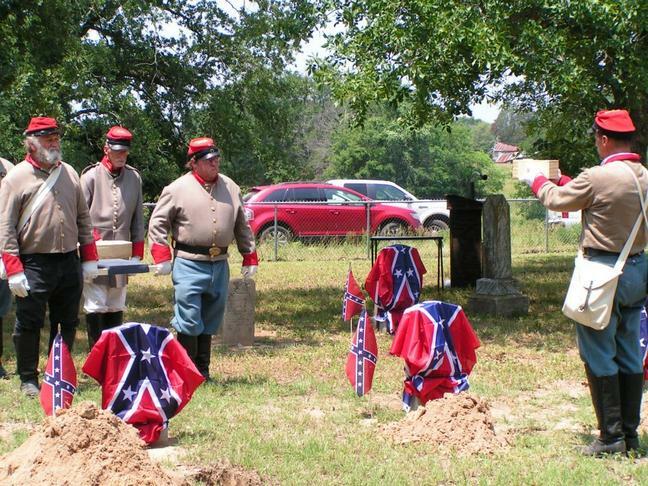 The John H. Reagan Camp #2156 SCV of Palestine, Texas hosted a four Confederate grave marker dedication ceremony at the Day Cemetery about 4 miles east of Fairfield on May 21, 2011. The ceremony honored the sons and grandson-in-law of William Wiley Day: Pvt. William Jackson Day, Pvt. James J. Day, 2 D Corp. Francis M. Day, and Pvt. Albert Thomas Miles.The Reagan Camp was assisted by the Johnson-Sayers-Nettles Camp #1012 SCV of Teague, Texas and the Colonel Roger Q. Mills, Chapter #2466 United Daughters of the Confederacy of Corsicana, Texas. The above photo of the John H. Reagan Camp #2156 SCV Palestine, Texas Val Verde Battery appeared on the CBS NEWS website in a Memorial Day Slide show with captions. The slide show included memorial day event photos from across the country. The above photo was taken by local attorney, Stuart Whitaker, The AP picked it up and then it was used by a few newspapers and CBS. The photo is of the Reagan Camp's Battery firing a 12 mountain howitzer. The camp members were participating at the Texas State Railroad Park during Military Weekend, May 28-29, 2011, to honor all American veterans including our Confederate veterans. 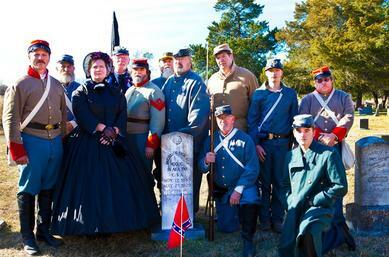 The event was held with various reenactors from different wars participating. Reagan Camp #2156 members and assistants posed by two of the seven Confederate grave markers dedicated at Augusta Cemetery near Grapeland, Texas on June 5, 2011. They are from left to right: Nancy Bundrick (UDC), Adjutant Dan Dyer, Billy Newsom, Holden Shamburger (back row – Douglas Camp), Chaplain Rod Skelton (middle row), Commander Marc Robinson (kneeling), Craig Robinson, Quartermaster Frank Moore, Caraline Robinson, Lt. Cmdr. Ronnie Hatfield, Historian Gary Williams, Deborah Robinson, and Channa Robinson. Not pictured, but taking part in the ceremony was Sgt.-at-Arms John Barnhart, Dale Roberts, and Shirley Roberts. Reagan Camp #2156 erected a flag pole in Anderson County on July 9, 2011 to fly a Confederate Battle flag in honor and memory of Confederate Veterans. From left to right are Cmdr. Marc Robinson, Adjt. Dan Dyer, Billy Newsom, Chap. Rod Skelton, Qtr. Mstr. Frank Moore, Vernon Holliman, and Lt. Cmdr. Ronnie Hatfield. Reagan Camp Delegates in foreground applaud CIC Michael Givins at the 2011 National SCV Reunion in Montgomery, AL. 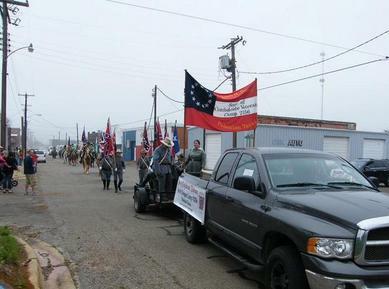 Reagan Camp participated in the 2011 Veterans Day Parade in Palestine, Texas. Cannon on float with Confederate Color Guard following. 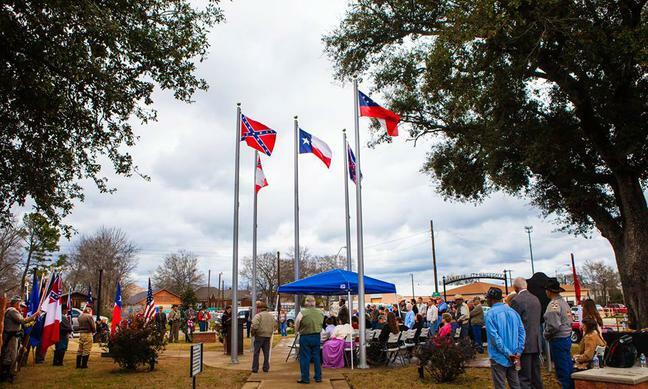 The Reagan Camp hosted a Confederate grave marker dedication ceremony at the Dabbs Cemetery near Neches, Texas on Feb. 25, 2012 at 1:00 PM honoring Pvt. William F. Freeman, Co. A, 20th Regiment Texas Cavalry, C.S.A. Reagan Camp 2156 members are folding the Confederate Battle flag that was covering the grave marker during the unveiling of the marker part of the dedication ceremony at Perry Starr Cemetery in Anderson County Texas on March 17, 2012. The flag was then presented to the oldest descendant present at the cermony in military fashion. Confederate Military Grave Marker of Pvt. 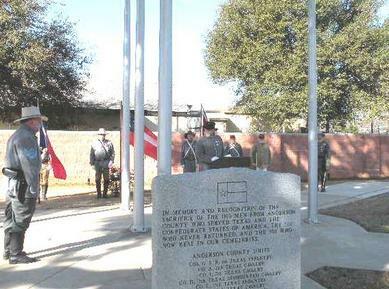 Perry Starr dedicated on March 17, 2012 by the Davis-Reagan Chapter 2292 UDC and the John H. Reagan Camp 2156 SCV. When the flag that was covering this marker was folded and afterward presented to the oldest descendant at the ceremony, the detail commander said to the family member, "On behalf of President Jefferson Davis and a grateful nation, I present you this token of appreciation for the service of your ancestor." This statement was followed by a slow salute of all color guard members to the flag then held by the family member. Reagan Camp #2156 members pose with Mrs. Dollye Jeffus, president of the Davis-Reagan Chapter 2292 UDC at her GG Grandfather, Texas Ranger John Sheridan's Texas Ranger Iron Cross ceremony. The Reagan Camp provided the color guard for the unveiling of the iron cross. Ranger John Sheridan died young in an Indian massacre. Four of his sons served in the CS Army. 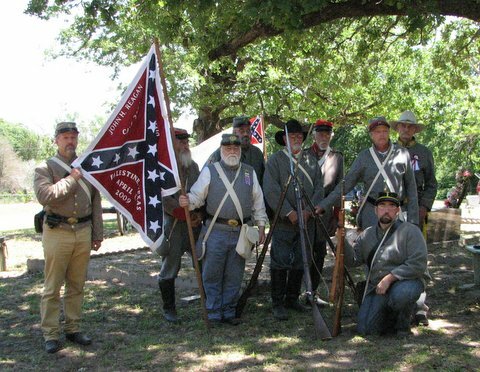 John H. Reagan Camp #2156 members re-enact as the Val Verde Battery at the annual event of the Confederate Reunion Grounds Historical Site near Mexia, Texas. 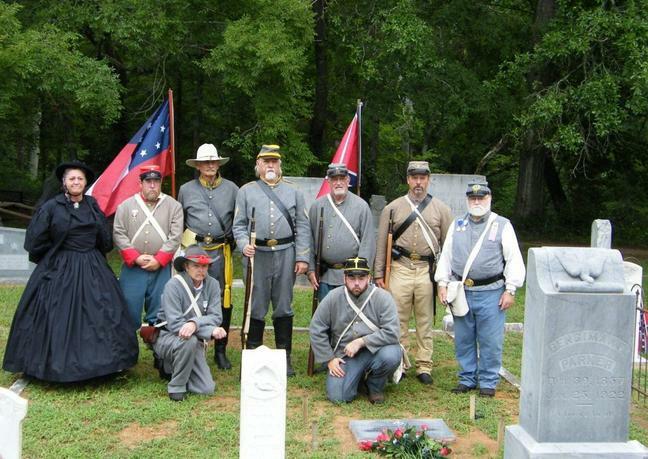 John H. Reagan Camp #2156 SCV and Davis-Reagan Chapter #2292 UDC team up together for the annual Confederate Memorial Day ceremony and grave marker dedication. Held at Old Palestine City Cemetery on 28 April 2012. Capt. W.G.W. Jowers was honored with the marker in this photo. 1st Lt. Nathan Gunnels was honored with a second grave marker this day. Biographies were read and given by descendants present. 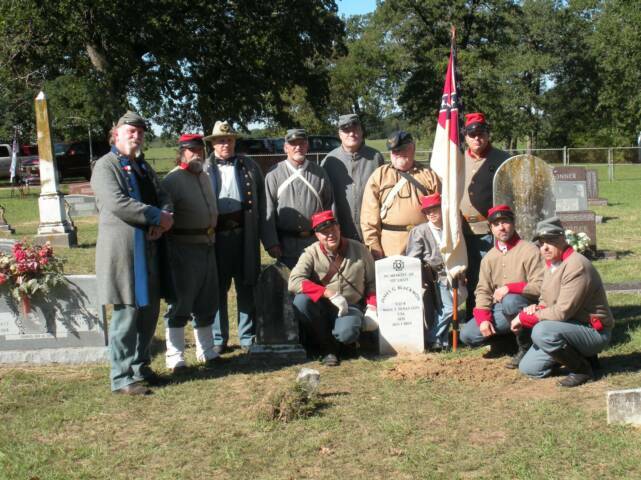 John H. Reagan Camp #2156 members held a grave marker dedication ceremony for Pvt. James A. McArthur, Co. A 13th Alabama Infantry at the Bonner Cemetery in Freestone County Texas on 5 May 2012 at 10:00 AM. Artillery and rifle volleys were used in the military tribute along with many other aspects of the ceremony. The grave marker dedication ceremony that was hosted by the Reagan Camp on 5 May 2012, 12:30 PM at the Hopson Burleson Memorial Cemetery in Freestone County Texas honored four Burleson brothers who served in the Confederate States Army. 2nd Lt. Oliver Burleson, Co. G, 7th Texas Infantry, Pvt. Isaac Burleson, Co. G, 7th Texas Infantry, Pvt. Joshua Burleson, Co. H, 28th Texas Cavalry, and Pvt. Moses Wilson Burleson, Co. H, 28th Texas Cavalry. A fifth brother, Farrier David Burleson, Co. H, 28th Texas Cavalry, did not receive a new grave marker, but was honored during the roll call. We ceremonially reinterred three of these brothers who never returned home and whose graves were either lost on the Jenkins Ferry battlefield or in a disturbed cemetery in Clarksville, Tennessee. Inside three small caskets was soil from their original burial site and a single Texas CSA uniform button, symbolizing returning them to uniform and their remains to Texas soil to rest with their loved ones. At the Burleson Cemetery Ceremony on 5 May 2012, 12:30 PM, Reagan Camp 2156 members symbolically reinter three of the five Burleson brothers who never returned home and whose graves were either lost on the Jenkins Ferry battlefield or in a disturbed cemetery in Clarksville, Tennessee. Inside three small caskets was soil from their original burial site and a single Texas CSA military uniform button, symbolizing returning them to uniform and their remains to Texas soil to rest with their loved ones. The John H. Reagan Camp #2156 of the Sons of the Confederate Veterans, located in Palestine, Texas hosted three separate Confederate Grave Marker Dedication Ceremonies on Saturday, May 5, 2012 beginning at 10:00 A.M. at the Bonner Cemetery, then 12:30 PM at the Hopson Burleson Memorial Cemetery, and another at 4:00 P.M. at the Rehoboth Cemetery. All cemeteries are located north of Fairfield in Freestone County. The Colonel Roger Q. Mills Chapter 2466 United Daughters of the Confederacy of Navarro/Freestone Counties and the Davis-Reagan Chapter 2292 UDC of Palestine also assisted with the ceremony. In the photo to the right are members of the Reagan Camp and UDC chapters who honored Pvt. D. P. Bennett, Co. B, 12th Texas Cavalry C.S.A. at the Rehoboth Cemetery. 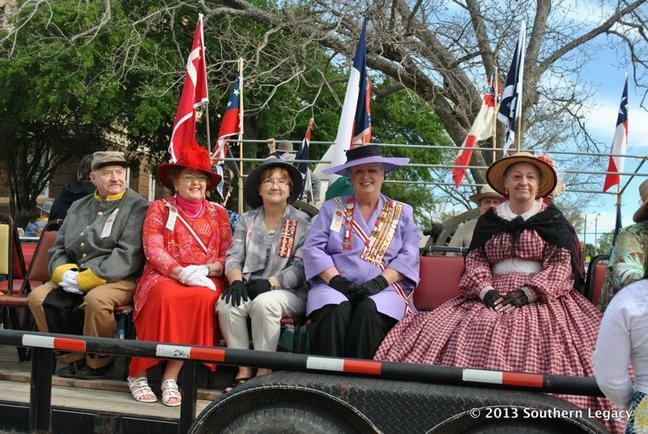 Left: the John H. Reagan Camp delegates to the 2012 Texas Division SCV Reunion held in Victoria, Texas on June 1-2. From L-R, Camp Quartermaster Frank Moore, Camp Commander Ronnie Hatfield, ET Brigade 2nd Lt. Commander Marc Robinson, Camp Adjutant/Treasurer Dan Dyer. Above: Compatriots of the John H. Reagan Camp 2156 have fun with a photo while setting five flag poles in the Confederate Veterans Memorial Plaza - Palestine on October 13, 2012. The camp's work constructing this plaza is steadily progressing toward something we feel Confederate Veterans would be proud of. Above: The Reagan Guards of the John H. Reagan Camp 2156 of Palestine, waiting to raise the flags on the five main flag poles and unveil the monument during the ceremony to dedicate the Confederate Veterans Memorial Plaza in Palestine on April 13th. 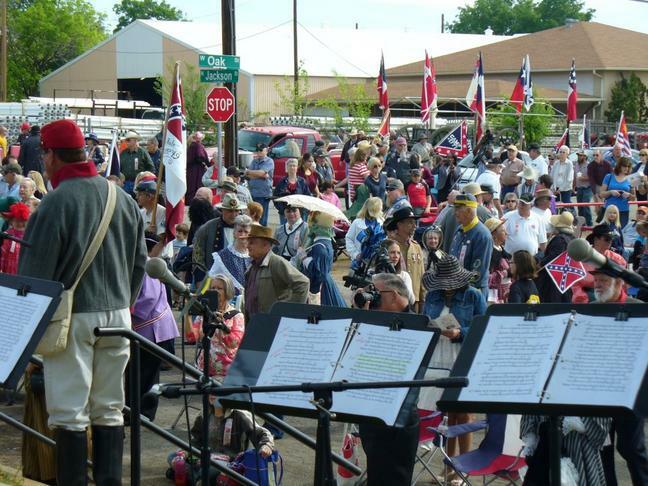 Above: There was a great turn out for the parade and dedication ceremony to open the new Confederate Veterans Memorial Plaza in Palestine on April 13, 2013. Above: The Frontier Brigade Band played several times before and after the dedication ceremony to open the Confederate Veterans Memorial Plaza in Palestine. They were excellent! This military brass band played authentic 1860 period music that everyone enjoyed. Above: Reagan Camp's 1st Lt. 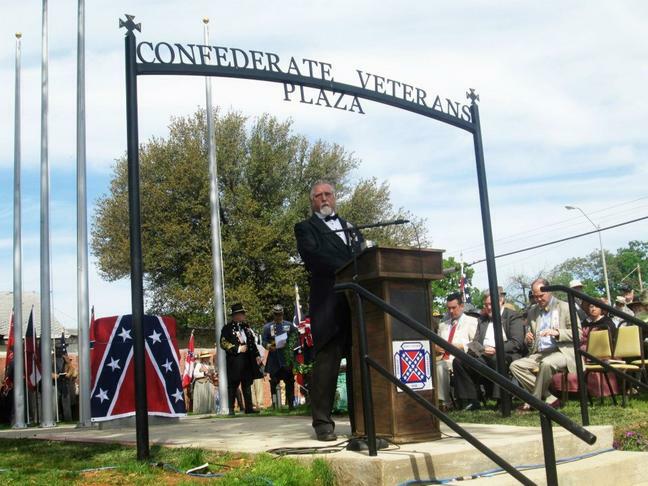 Commander Rudy Ray was the Master of Ceremonies for the dedication of the Confederate Veterans Plaza in Palestine. Above: The Confederate Veterans Memorial Plaza Parade, flag corps, which was made up of men from many different SCV camps from across Texas and led by Paul Hamilton, 1st Sgt. of the Lone Star Color guard, NE Texas Brigade SCV. Above: The Johnson Guards of the Col. Middleton Tate Johnson Camp of Arlington, Texas, commanded by Texas Division Color Sgt. Jack Dyess, lead the parade with the official colors. 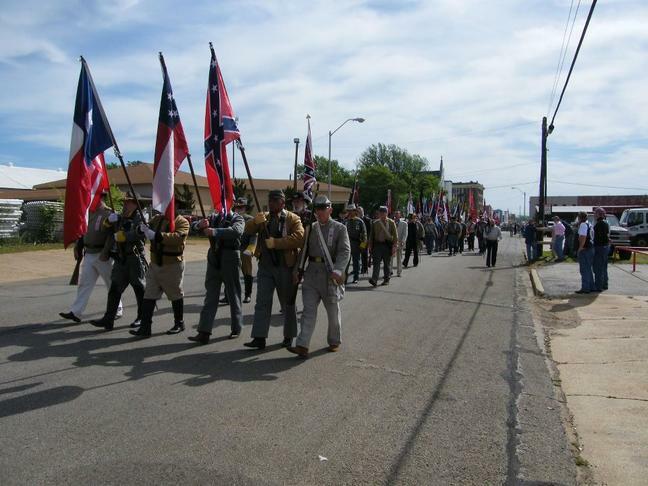 There were many SCV members marching behind them in this parade that began the dedication of the Confederate Veterans Memorial Plaza in Palestine on April 13, 2013. 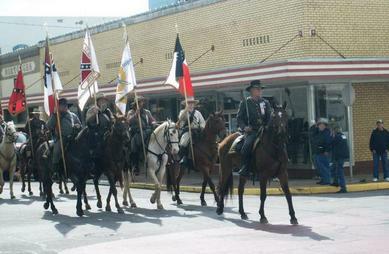 Above: The Texas Cavalry Division SCV with the many flags they carried on their mounts during the parade and dedication ceremony to open the new Confederate Veterans Memorial Plaza in Palestine on April 13, 2013. Their Commander, Calvin Allen, is in the lead. 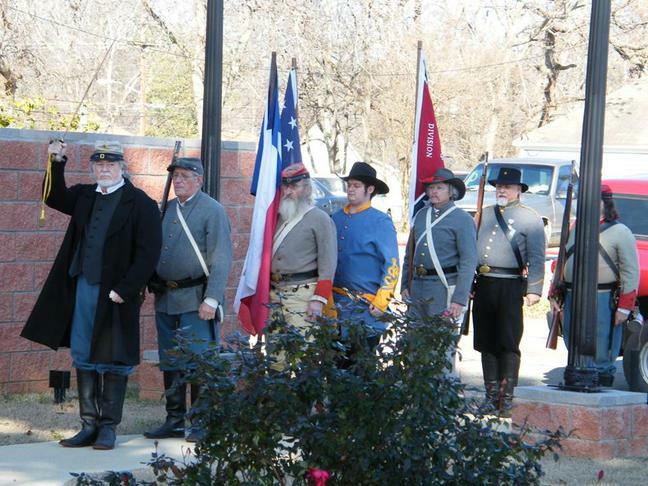 Above: The Honor Guard for the parade and dedication ceremony to open the new Confederate Veterans Memorial Plaza in Palestine on April 13, 2013. It is led by Paul Gramling, Heritage Defense Chief of the Army of Trans-Mississippi SCV. 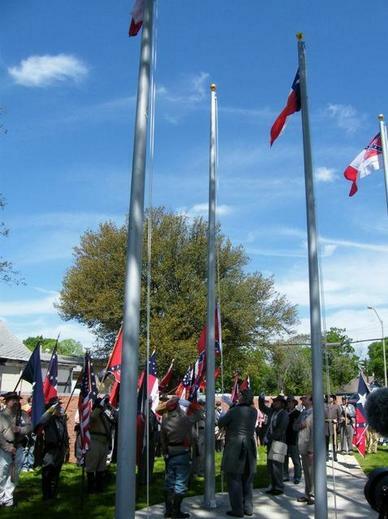 Above: The Reagan Guards raising the Confederate Battle flag as the fifth flag to fly at the new Confederate Veterans Memorial Plaza in Palestine on April 13, 2013. Kelly Barrow, Lt. Commander-in-Chief of the National SCV, had the honor of presenting this flag to the color guard to raise. 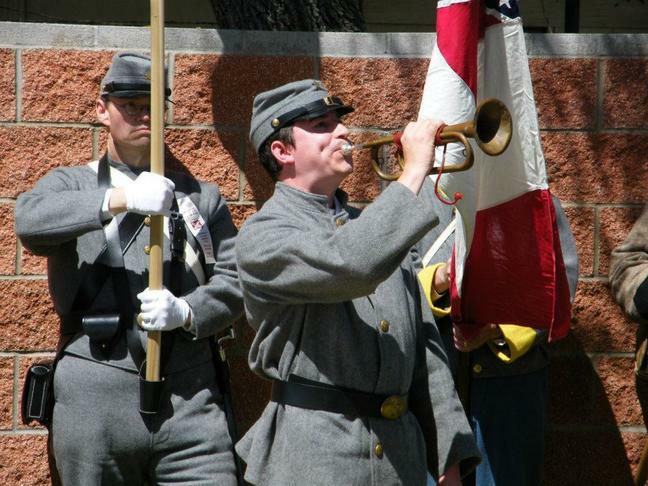 Above: Caleb Estrada, playing Taps immediately after the 21 gun salute from the honor guard during the dedication ceremony for the Confederate Veterans Memorial Plaza in Palestine on April 13, 2013. 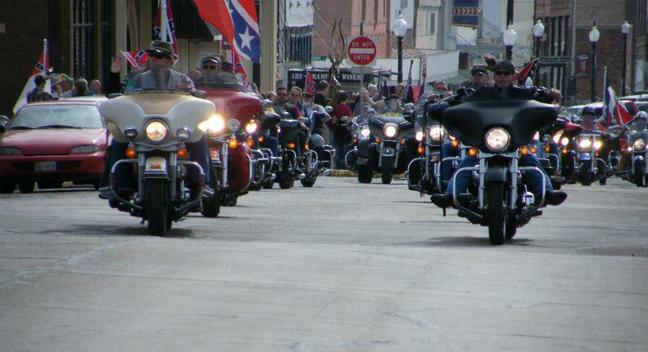 Above: The SCV Mechanized Cavalry with their many riders, rode down the parade route to the Confederate Veterans Memorial Plaza ahead of the main body of the parade on April 13, 2013. 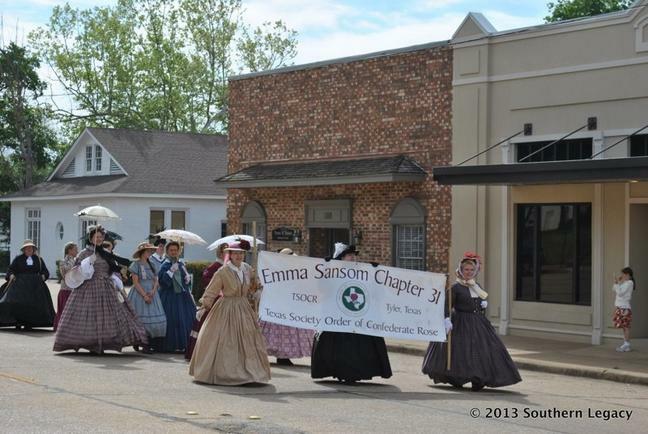 Above: The Emma Sansom Chapter of the OCR, Tyler, Texas, laid roses at the base of the monument during the person tribute portion of the dedication ceremony on April 13th. Above: Sam Allen, member of the Friends of the Sons of Confederate Veterans and a member of the Johnson Guards of the Johnson Camp in Arlington gave greetings from the Friends and had some wonderful words about the history of ALL those who served the Confederate Army, to share with everyone. 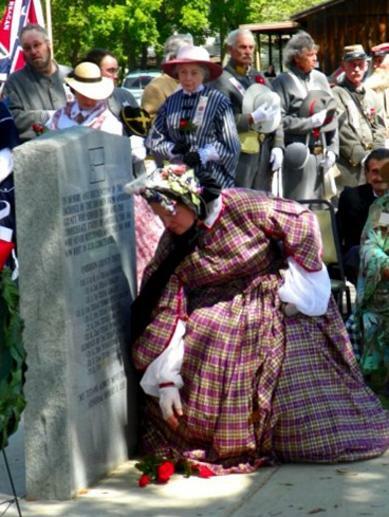 The collection of photos immediately below are only a few from the Parade and Dedication Ceremony of the Confederate Veterans Memorial Plaza in Palestine that was built and will be maintained by the John H. Reagan Camp 2156, SCV of Palestine. The John H. Reagan Camp will always be grateful to the men, ladies, and young ones who helped make the plaza dedication day, April 13, 2013, a very special day to remember. Above: The Confederate Veterans Memorial Plaza in Palestine on April 14, 2013. Ninety percent complete, there will be more improvements to come. Please come by 600 West Oak Street in Palestine, to pay respect to the men this plaza was built to honor, and to keep up with future site improvements. Left: Reagan Camp Quartermaster, Frank Moore, spreading sealer over some recently installed memorial brick pavers at the Confederate Veterans Memorial Plaza in Palestine as the six year old son of Reagan Camp member, Marc Robinson, looks on. Above: Emma Sansom Chapter 31 Order of Confederate Rose march in the parade from the Anderson County Courthouse to the Confederate Veterans Memorial Plaza on April 13, 2013. 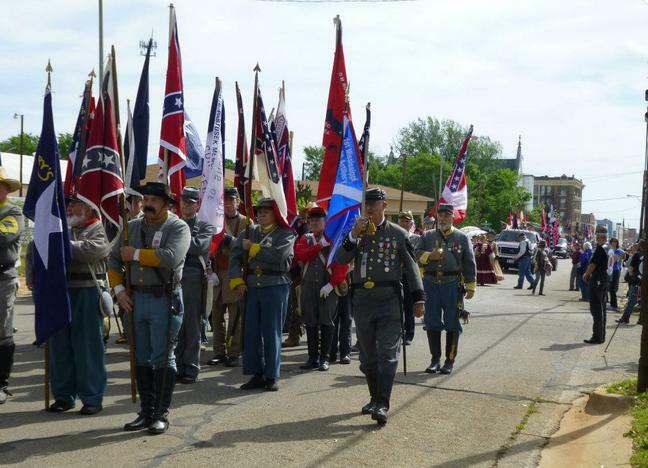 Above: Davis-Reagan Chapter 2292 as well as Texas Division officers of the United Daughters of the Confederacy took part in the parade and ceremony to dedicate the Confederate Veterans Memorial Plaza in Palestine on April 13, 2013. 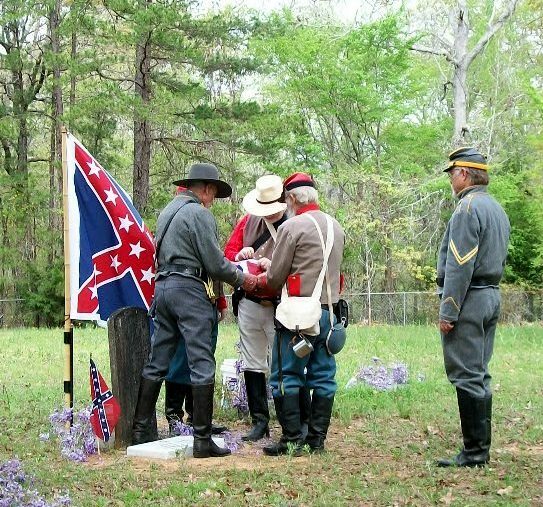 Above: The John H. Reagan Camp 2156 hosted a Memorial Ceremony for eleven Confederate Veterans buried at the Mt. Zion Cemetery in Freestone County on May 4, 2013. Davis-Reagan UDC assisted. L-R are Marc Robinson, Frank Moore, Rod Skelton, John Barnhart, Dan Dyer, Tom James, Gary Gibson, Dale Roberts and kneeling is Bobby Francis. 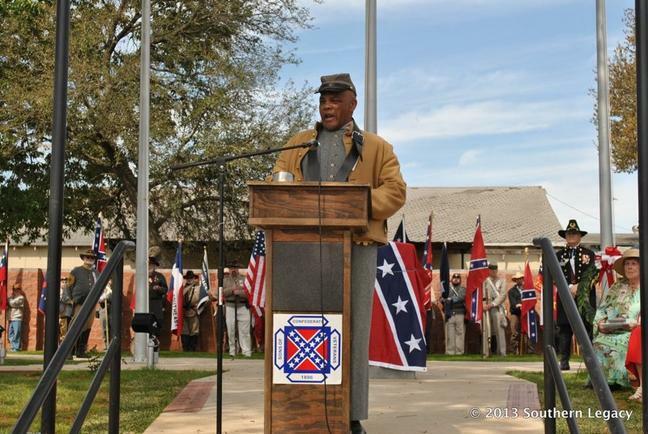 Above: The John H. Reagan Camp 2156 hosted a Confederate marker dedication ceremony for Pvt. Thomas Kennedy, Co. 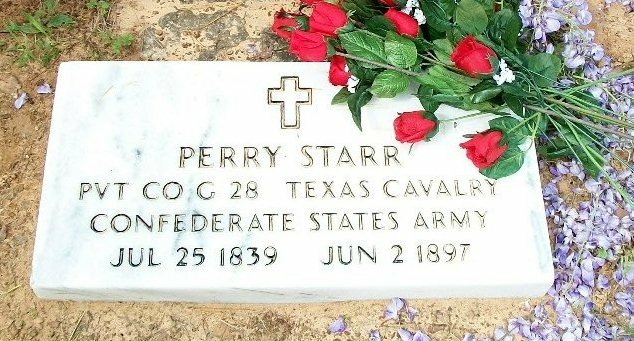 I, 7th Texas Cavalry on July 27, 2013 at the Pilgrim Cemetery in Anderson County Texas. Davis-Reagan UDC assisted. L-R standing are Nancy Bundrick, Billy Newsom, Dale Roberts, Rudy Ray, Dan Dyer, Marc Robinson, Rod Skelton and L-R kneeling are Gary Gibson and Bobby Francis. Above: The Davis-Reagan Chapter 2292 UDC and the John H. Reagan Camp 2156 SCV hosted a birthday anniversary celebration in memory of John H. Reagan, postmaster general of the C.S.A. at his home site near Palestine, Texas on 5 Oct 2013. Pictured are members of the UDC and the SCV who were in the ceremony and in attendance. 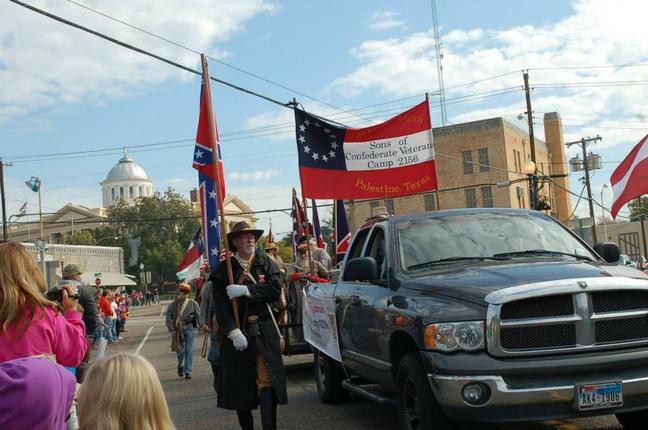 Above: The John H. Reagan Camp 2156 forwarded our Confederate ancestors colors in the Palestine Hot Pepper Festival Parade on 26 OCT 2013. Members of the Maj. W. H. "Howdy" Martin Camp 1241 in Athens ,also helped the Reagan Camp compatriots in the parade. 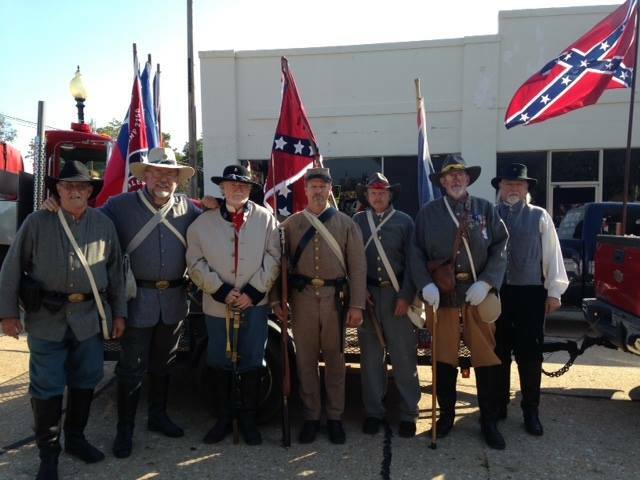 The Reagan Camp followed the parade with a living history exhibit at the Confederate Veterans Memorial Plaza in Palestine. 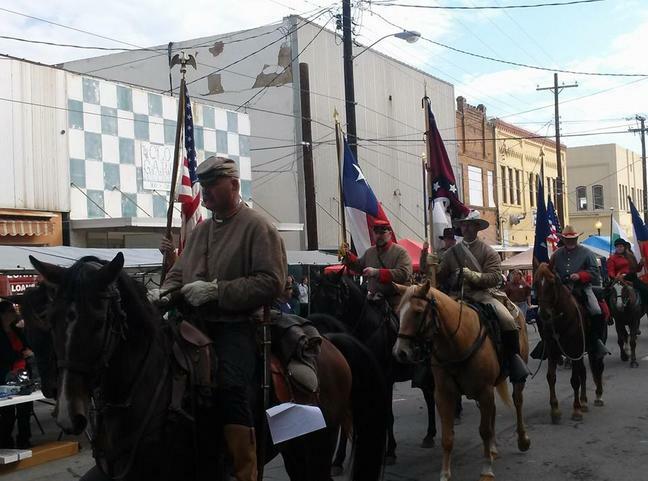 Above: The East Texas Cavalry Division SCV helped the John H. Reagan Camp 2156 forward the colors in the Palestine Hot Pepper Festival Parade on 26 OCT 2013. There were six members of the newly formed mounted color guard present including Reagan Camp past commander Marc Robinson and five members of the Capt. James P. Douglas Camp 124 in Tyler. 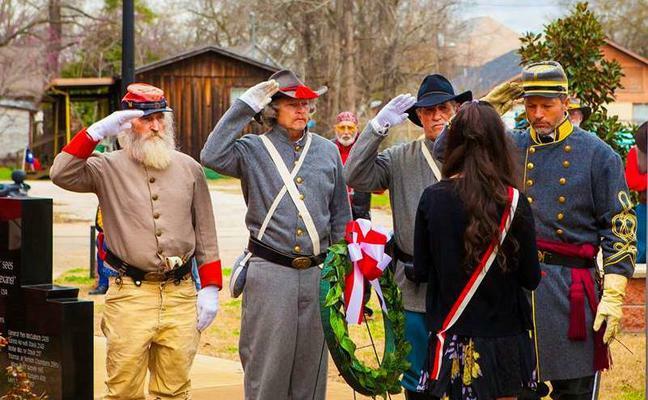 Above: The John H. Reagan Camp 2156 held a Confederate Heroes Day Ceremony at the Confederate Veterans Memorial Plaza in Palestine on January 18, 2014. The Davis-Reagan Chapter 2292 UDC participated in the event as well. Compatriots who participated and in period attire were UDC Pres. Dollye Jeffus, Commander Rudy Ray, Doug Smith, Gary Gibson, Dale Roberts, Frank Moore, Billy Newsom, Adjt. Dan Dyer, Gary Williams, and Marc Robinson. 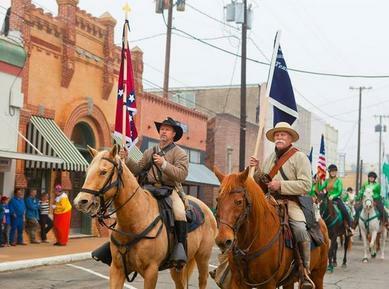 Above: East Texas Cavalry Division SCV members, Marc Robinson, left, and Steve Clinch, right, assisted the John H. Reagan Camp 2156 in forwarding the colors in the Palestine Dogwood Trails parade on March 22, 2014. 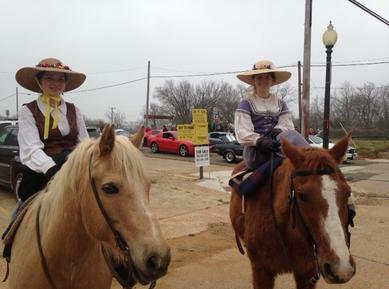 Above: Caraline Robinson, left, and Channa Robinson, right, rode their horses with side saddles and wearing 1860 period dress immediately in front of the East Texas Cavalry Division SCV in the Palestine Dogwood Trails parade on March 22, 2014. Channa is a member of the Davis-Reagan Chapter 2292 UDC of Palestine and both are the daughters of Deborah and Marc Robinson. Above: The John H. Reagan Camp 2156 forwarding the colors in the Palestine Dogwood Trails parade on March 22, 2014 with a float carrying an 1860 period mountain howitzer, men, women, and children in 1860 period uniform and dress and with some carrying muskets and/or Confederate flags. The Reagan Camp was assisted by members of the Davis-Reagan Chapter 2292 UDC of Palestine and the Maj. W. H. "Howdy" Martin Camp 1241 of Athens, Texas. 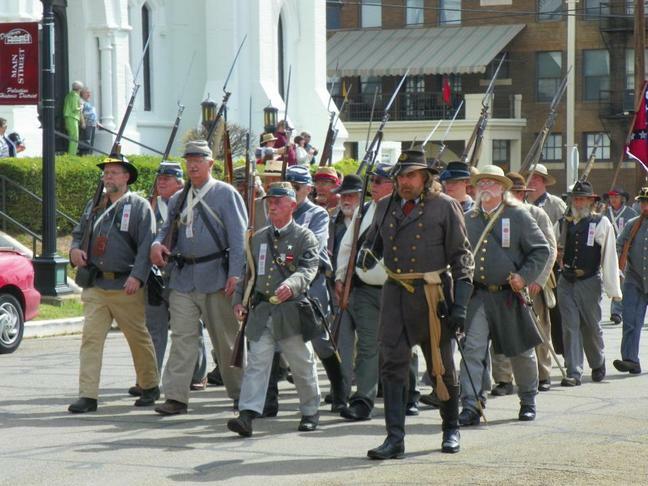 Above: The John H. Reagan Camp 2156 held a Confederate History Demonstraton at the Confederate Veterans Memorial Plaza in Palestine immediately after the Dogwood Trails parade and during the festiva on March 22, 2014. Reagan Camp HIstorian Gary Williams and Compatriot Andrew Harris were in charge of this extremely good effort to share our Confederate ancestors history.They had on display relics and replicas of various items used during the 1861-1865 time period. Above: The John H. Reagan Camp 2156 SCV assists the Davis-Reagan Chapter 2292 UDC at the annual John H. Reagan Birthday Ceremony on October 4, 2014 at the Reagan Memorial Statue in Palestine, Texas. 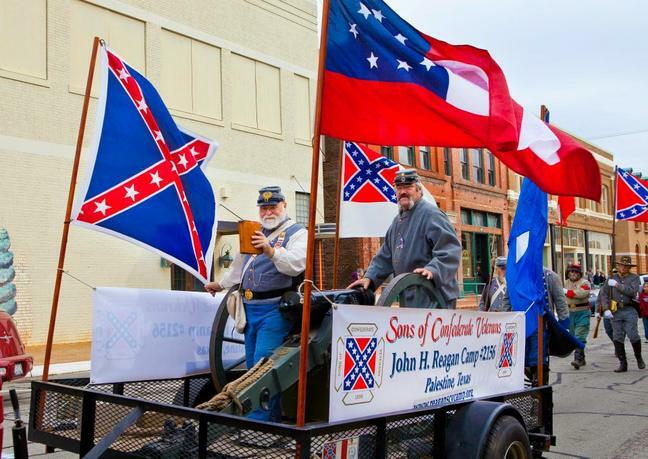 Above: Compatriots from the John H. Reagan Camp 2156 forwarding the colors in the Palestine Hot Pepper Festival parade on October 25, 2014 with a float carrying an 1860 period mountain howitzer, men in Confederate uniform with some carrying muskets and others Confederate flags. The Reagan Camp was assisted by the Maj. W. H. "Howdy" Martin Camp 1241 of Athens, Texas. Above: The Reagan Guards of the John H. Reagan Camp 2156 SCV prepares to post the colors at the annual Confederate Heroes Day Ceremony held at the Confederate Veterans Memorial Plaza - Palestine on January 17, 2015. The Davis-Reagan Chapter 2292 UDC of Palestine was a co-host in this ceremony. Assisting in the color guard was a member of the Maj. W. H. "Howdy" Martin Camp 1241 of Athens, TX. 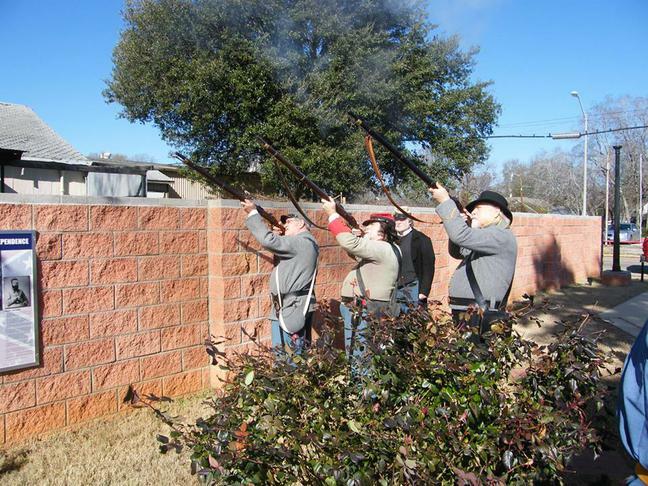 Above: The Reagan Guards of the John H. Reagan Camp 2156 SCV firing a musket volley during the military tribute of the annual Confederate Heroes Day Ceremony held at the Confederate Veterans Memorial Plaza - Palestine on January 17, 2015. The Davis-Reagan Chapter 2292 UDC of Palestine was a co-host in this ceremony. 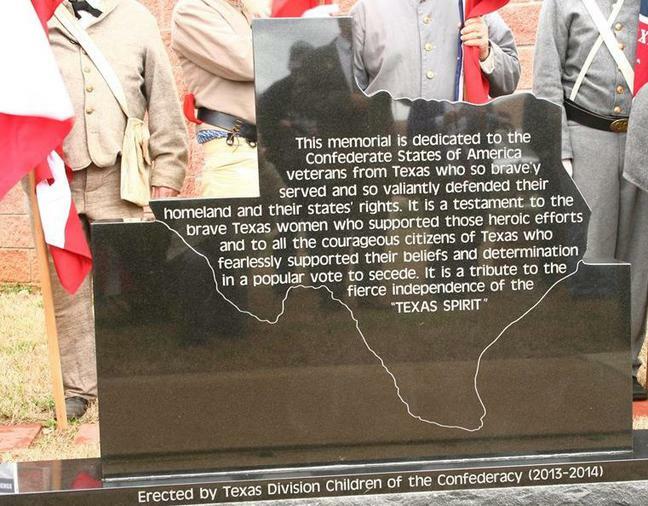 Above: On March 14, 2015, the Texas Division Children of the Confederacy assisted by the John H. Reagan Camp 2156, Sons of Confederate Veterans, held a ceremony to dedicate the beautiful black granite marker that was placed in the Confederate Veterans Memorial Plaza - Palestine by the CofC. The monument proudly honors the many C. S. A. Veterans from Texas. The honorable Judge Bascom Bentley was the keynote speaker. 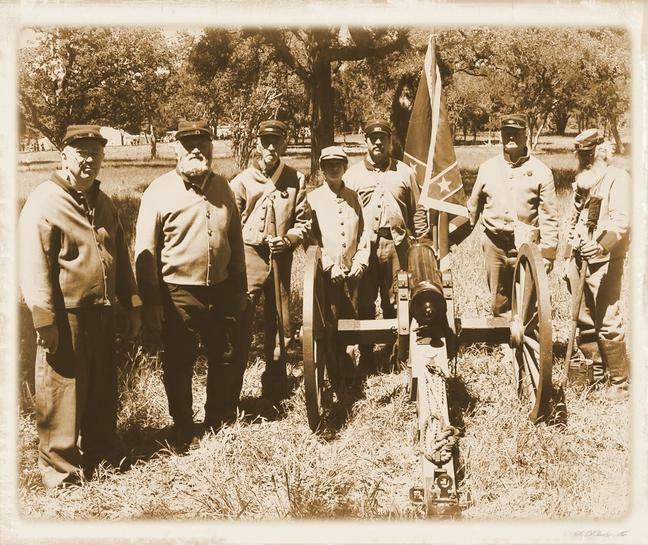 The Sons of Confederate Veterans were represented by the Texas Division Commander, Johnnie Holley, and officers and compatriots from the 4th, 5th, 6th, 8th, 9th, 10th, & 11th Texas brigades. SCV Mechanized Cavalry Troopers from 1st Battalion Co. C. 1st Platoon and 2nd Platoon were in attendance. The SCV Camps represented were the Major W.H. “Howdy” Martin Camp 1241, Stone Fort Camp 1944, Gen. Joseph L. Hogg Camp 972, Lone Star Defenders Camp 2234, Capt. James P. Douglas Camp 124, New Salem Invincibles Camp 2107, The Cross of Saint Andrew’s Camp 2109, General John Gregg Camp 958, Hood’s Texas Brigade Camp 153, Grimes County Greys Camp 924, Captain James Gillaspie Camp 226, Private Kyle Grundy Needham Camp 2171, John Bell Hood Camp 50, and the General W. L. Cabell Camp 1313. The UDC was represented well by the Davis-Reagan Chapter 2292, Southern Cross Chapter 2502, Lee's Traveller Chapter 957, and Magnolia Rangers Chapter 2544. 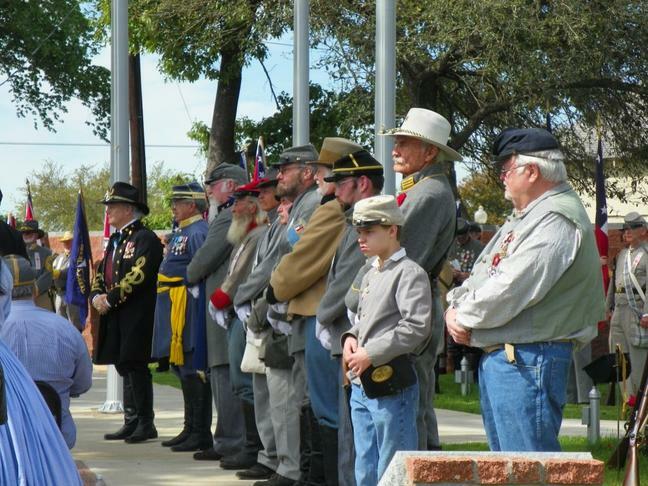 Above: Attendance for the Children of the Confederacy monument dedication at the Confederate Veterans Memorial Plaza in Palestine on March 14, 2015 was great! Above: Children of the Confederacy Monument honoring all C.S.A. Veterans from Texas located at the Confederate Veterans Memorial Plaza - Palestine. Above: Reagan Guards saluting the Confederate battle flag after it was presented to the 2013-2014 president of the Children of the Confederacy during the monument dedication ceremony at the Confederate Veterans Memorial Plaza in Palestine on March 14, 2015. 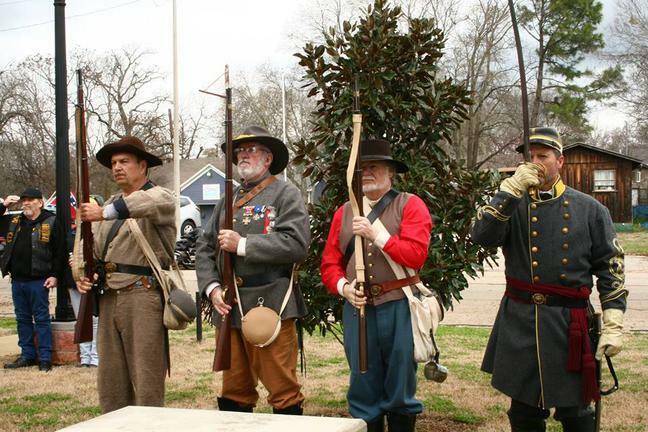 Above: Honor Guard at Present - ARMS during the playing of Tatoo immediately after the military tribute (rifle volley) at the Children of the Confederacy Monument Dedication ceremony at the CVMP-Palestine on March 14, 2015.